The Gilded Age of Drawing in America at the Metropolitan Museum of Art. Thomas Wilmer Dewing, Portrait of a Lady, after 1894, silverpoint on paper, mounted on pulp board, 22 1/2 x 18 7/8 in. Purchase, Bequests of Eliza W. Howland, Collis P. Huntington, Vera Ruth Miller, Lillie P. Bliss, Egbert Guernsey Rankin, and George D. Pratt, by exchange; Gifts of George I. Seney, Mrs. George Langdon Jewett, A. W. Bahr, Allison V. Armour, E. Everett Dickinson Jr., J. Pierpont Morgan, John G. Agar, and George A. Hearn, by exchange; and Vain and Harry Fish Foundation Inc. Gift, 1984, The Metropolitan Museum of Art. The Gilded Age of Drawing in America at the Metropolitan Museum of Art has not received the fanfare it deserves. It is not accompanied by a Met publication, nor is it easy to locate within the museum, tucked as it is in a rear section of the first floor of the American wing. Though not easy to find, this exhibition is not to be missed. When you open the double glass door entrance to the exhibition and descend the elegant wooden staircase leading into the quiet, dimly-illuminated suite of galleries, you will find yourself surrounded by light-sensitive drawings from the museum’s own collection that are rarely displayed. With the exception of several recent important acquisitions, the major portion of the artwork came into the Met’s collection just after its founding, in 1870, and within the artists’ lifetimes. The exhibition, organized by Sylvia Yount, Lawrence A. Fleischman Curator in Charge of the museum’s American wing, is an example of the museum’s recent commitment to share lesser known parts of its peerless collection with the public on a rotating basis. It also is a clear indication of the growing recognition of drawing as an important art, one increasingly recognized as significant as painting. All of the images in the exhibition are works on paper, and therefore, in this instance, conveniently categorized as “drawings,” though many might as well be referred to as paintings. 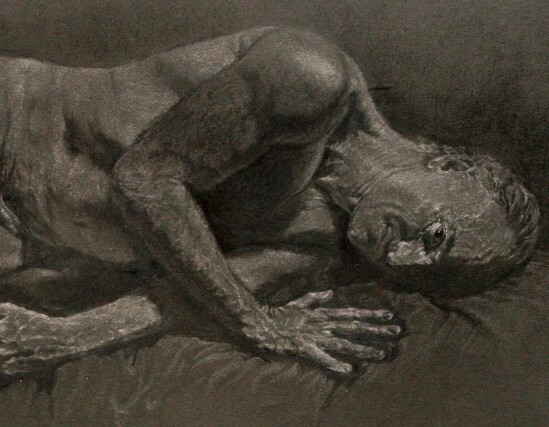 As such, this selection of work reflects the blurring of the concepts of drawing and painting. 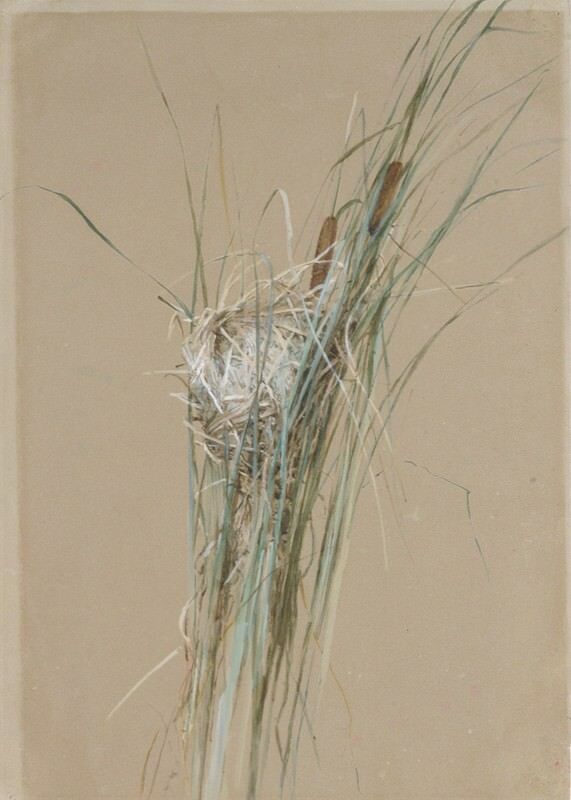 Fidelia Bridges, Bird’s Nest in Cattails, ca. 1875, watercolor and gouache on light brown wove paper, 14 x 9 7/8 in. Anonymous Gift, in memory of Harry Rubin, 1989, The Metropolitan Museum of Art. 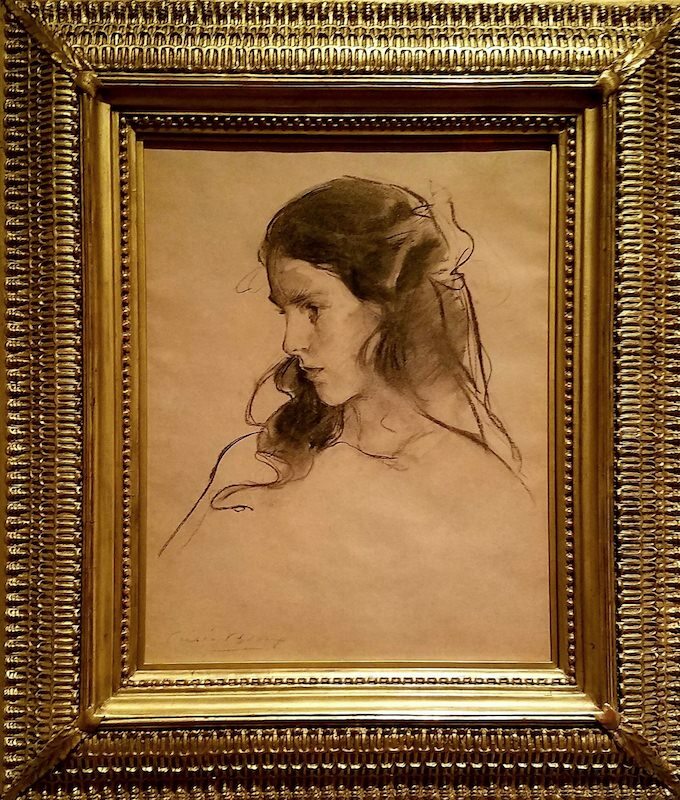 The exhibit includes work in charcoal, graphite, chalk, pastel, watercolor, gouache, multi-media, with a single stunning silverpoint by Thomas Wilmer Dewing, Portrait of a Woman (1894). Although watercolor was the preeminent medium used by artists during this era, every image included in this exhibition is an outstanding example of other mediums available for use during the late nineteenth and early twentieth centuries. The term “Gilded Age” was adapted from the title of a novel by Mark Twain and his neighbor Charles Dudley Warner, The Gilded Age: A Tale of Today, published in 1873. The title had been taken from a line in Shakespeare, “To gild refined gold, to paint the lily,” that describes wasteful and ridiculous excess. The period was marked by great disparity between rich and poor, and between the freedoms and limitations between men and women artists during the rise of cultural institutions such as the Pennsylvania Academy of Fine Arts, the Art Students League of New York and the Metropolitan Museum of Art itself. The group of artwork chosen for The Gilded Age of Drawing in America reflects well the tempo of those times. The images are hung thematically (figure, landscape, and still life) and range from sketches and preparatory studies to independent, fully-realized works of art. There are three dozen images in the exhibition, including several by watercolor masters such as Winslow Homer, John Singer Sargent, James McNeil Whistler, and Thomas Eakins. It is difficult not to be simply overwhelmed by the beauty of the work, but it is also worth pausing to understand exactly how each was done. It is interesting to note, for example, how many of the artists of the period chose to work on rough wove surfaces of a warm umber hue so different from many contemporary papers of glaring white. The descriptive texts accompanying the images note the surfaces as paper of different textures but they do not note its color. By looking closely at unworked areas within or near the borders of the art, you can often detect the underlying color and value present. 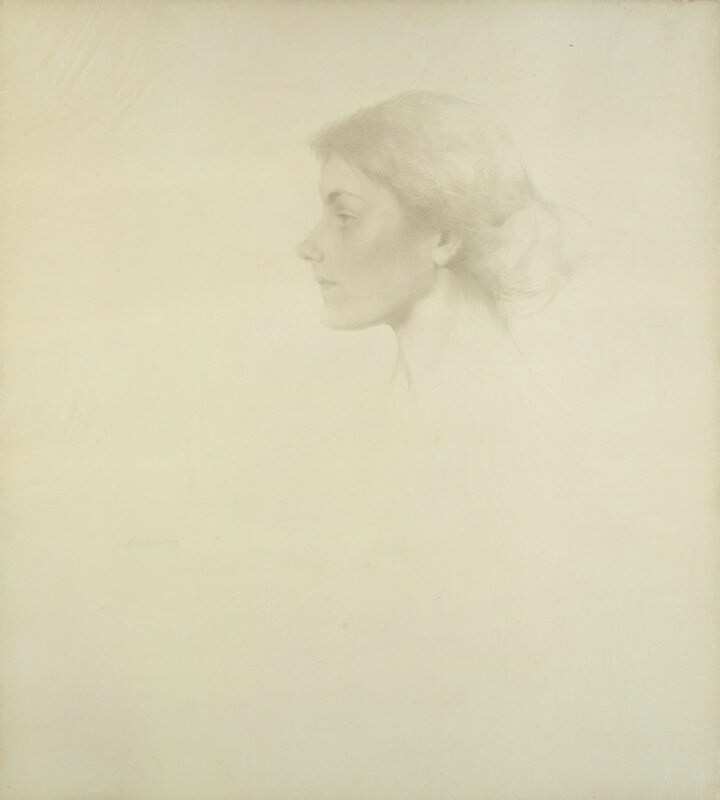 Cecelia Beaux, Ernesta Drinker, 1905, charcoal on tan paper, 18.5 x 14.4 in. The Metropolitan Museum of Art. It is also worth noting how many of the venerated watercolor artists of the period used gouache and opaque white in their paintings in violation of our own era’s recurrent warning against that “non-traditional” practice. In many cases, the original work has not been on view for thirty years or more. Some of the images in the exhibition are very familiar from countless reproductions while some will be for some new discoveries. Mary Cassatt’s Mother Feeding Child (1898), a pastel on wove paper, mounted on canvas, is perhaps better known than the work of the six other women artists in the exhibit. 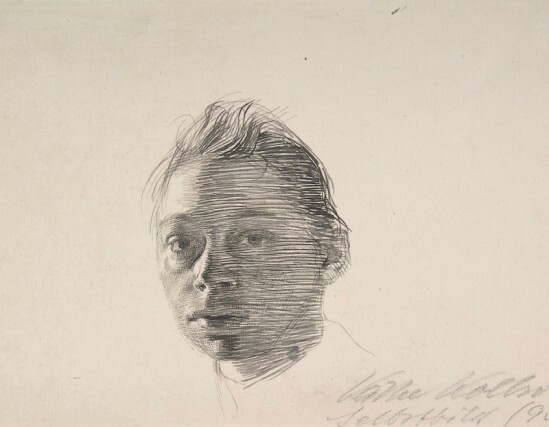 Cecilia Beaux’s drawing Ernesta Drinker (1905) is simply done, charcoal on brown paper, and totally, utterly, completely charming. Violet Oakley’s portrait Cleveland Johnson indicates both her indebtedness to Cecilia Beaux, her “first master” at the Pennsylvania Academy of Fine Arts, and Oakley’s own voice. 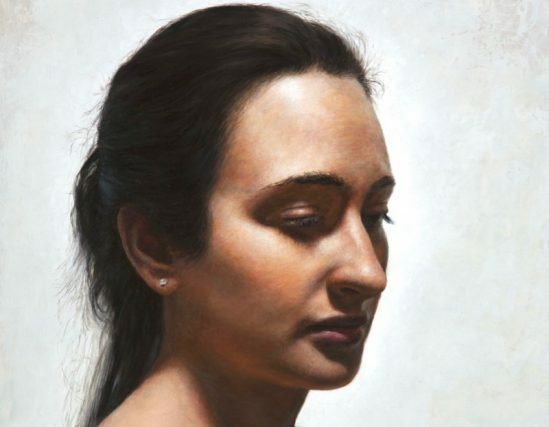 The small white chalk and pastel color accents Oakley uses in her work adds a different emotional dimension and strength to her poignant portrait. Jane Peterson, Parade, undated, gouache, watercolor, charcoal, and graphite on gray wove paper, 23 15/16 x 18 in. Gift of Martin Horwitz, 1976, The Metropolitan Museum of Art. 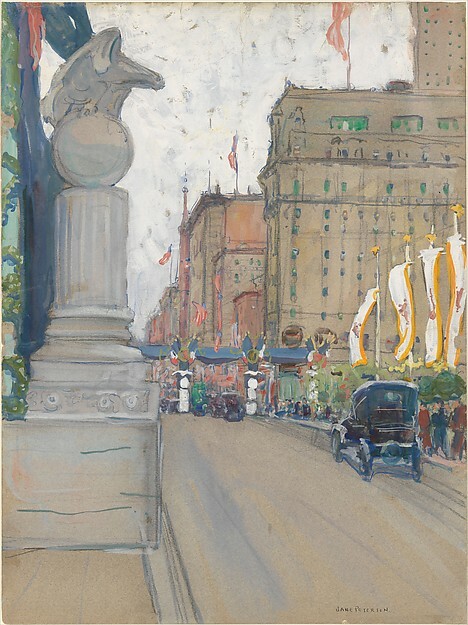 Far from nature, in Jane Paterson’s mixed media work Parade (1917–19), painted in support of the country’s World War I efforts, the artist’s vantage point is on the street near her studio at 58 West 57th, across from a crowd of faceless New Yorkers watching the disappearing parade and the flags and banners flapping in the breeze from the tops of the buildings. The foreground, the pavement, is indicated almost entirely by the rough texture and concrete color of the paper’s finish. Paterson’s confident, quick brush strokes, some thick with heavy opaque gouache, some dry brushed, others transparent wide wet on wet watercolor washes or thin sharp accents of line, all add to the feeling of movement, of a fleeting moment caught in a grand painterly style. Henry Ossawa Tanner’s Study for the Young Sabot Maker (1893), is an example of a preparatory grisaille in gouache and watercolor. It was begun when he was a student of Thomas Eakins at the Pennsylvania Academy of Fine Arts, but the final version of the painting, with the composition reversed, was completed in France where Tanner had moved in response to the racial bias he felt in America. Henry Ossawa Tanner was the first African American to gain international fame. Charles Ethan Porter was the first known professional African-American artist to specialize in still-life images. Although he was highly recognized and esteemed as an artist during his lifetime, he was destined to die in poverty. His work was recently added to the museum’s collection and is highlighted in the exhibition. 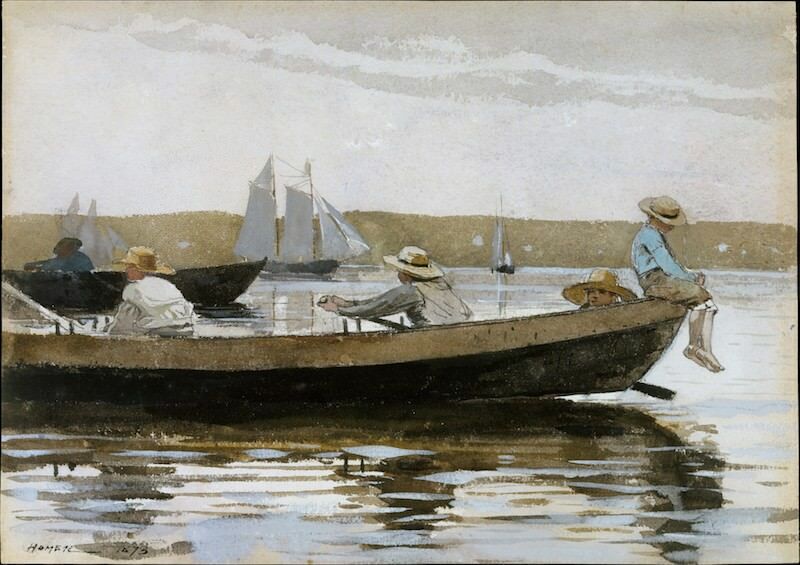 Winslow Homer, Boys in a Dory, 1873, watercolor washes and gouache over graphite underdrawing on medium rough textured white wove paper, 9 3/4 x 13 7/8 in. Bequest of Molly Flagg Knudtsen, 2001. The Metropolitan Museum of Art. Among the more familiar images in the exhibit is Winslow Homer’s Boys in a Dory (1873), done on a warm white medium wove paper. It depicts young boys out rowing one warm summer’s day. Traces of graphite hint at how Homer sketched in the composition and defined details like the mischievous eyes of the boy who is peeking out from the picture as well as the profile and the anatomy of the legs of the one sitting with his toes curled dangling over the water. The other boys’ faces are turned away hidden from our view. All of them wear straw hats to shield their eyes from the bright sunlight. Homer’s watercolor is about that light and the use of optical illusion to capture it. By darkening areas around the white of the paper, its white looks whiter. Homer sets the stage to capture the luminosity of the day with subtly warm grey washes for the clouds and the sky and murky darks at the bottom of the dory where it merges, submerges and blurs with the boat’s shadow in the water directly below it. The noon sun is not seen. It is felt. Dry brush strokes of dark skim over the rough paper’s surface to create a multitude of tiny dots and spots of light where the lower fibers remain untouched and white. Deftly painted sharp-edged details of cool white opaque gouache appear slightly lighter than the tone of the paper and add bright accents. They sparkle. The museum’s cool grey walls enhance Homer’s efforts. The sunlight in the picture shimmers and plays magically on the water’s waves. There are too many superb images in The Gilded Age of Drawing in America to note in the space of a review. This exhibition must be seen, preferably multiple times, before it closes December 10, 2017.